It's been a busy few weeks at the park. Our contractor Greenspan has been working in tough conditions to make sure the new assault course and dog activity course are ready. We know many of you are desperate to try out the equipment so keep reading for opening dates. It’s all part of our Forts and Fleets project, part funded by the Armed Forces Covenant, for military and civilian communities to enjoy the great outdoors. 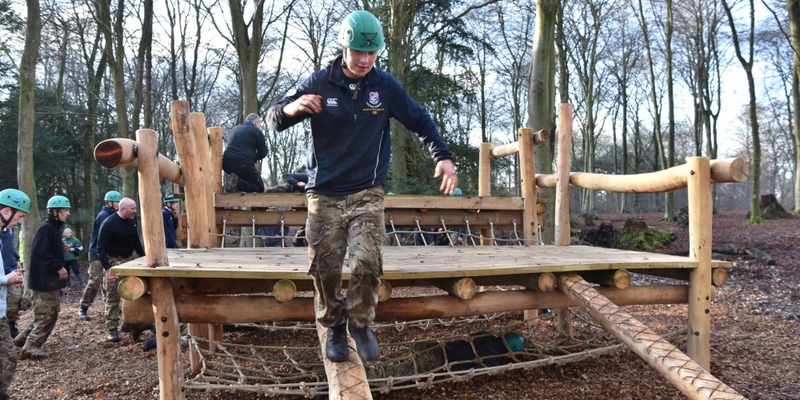 The assault course will open on 21 January for our Winter Fitness Day. Innovations Fitness will be leading the challenge from 9am to 1pm. It's going to be muddy, it’s going to be tiring – it's going to be great fun! We have limited spaces left, so booking is essential. Phone 02392 595040. One lucky group from Seaford College have already tested the course. Twenty cadets climbed, jumped and swung their way around. It was exhausting just watching them! The dog activity course was also tested on the day by our four legged friends, although some could do with a little more training! Take a look at this Forces TV video report from the day. The course will open this weekend (13/14 January). We're also building a new play area and community space, due to open from 20 January. The play space is inspired by the project's military connections; local ancient forts and wooden dens every child loves to build. We're looking forward to its first real test during the next half term week. And finally the community space will be an impressive addition to the park's popular BBQ offer. The design includes a pizza oven at its heart with shelters and seating for groups and families to relax. We can't wait to see the results from all you budding outdoor chefs.